On Tuesday june 20th The European Heart Rhythm Association (EHRA), a Registered Branch of the European Society of Cardiology (ESC), awarded the first prize of the 2017 inventors award to Pierre-François Migeotte and the HEARTKINETICS ULB Spin-off team for the invention of the Kino-cardiograph. HEARTKINETICS identified a huge gap in the frequency of vital signs monitoring, notably cardiac, when patients are moving from the intensive care unit via ward towards home. In the post hospitalization period, when patients are at high risk of complication, deterioration of their health can be missed. In addition, when faced with questions and doubts about the success of their surgery, many patients are turning towards unproven health-a-like apps in order to get an easy and quick answer and get away from their stress. Very often this causes further damage to the doctor patient relationship. This demonstrates a huge unmet need of clinically validated smart, automated, wearable devices that could provide both answers to the patient and to the health care professional on the effectiveness of the treatment or the healthy recovery after surgery. 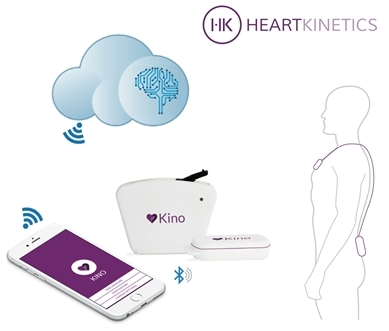 The Kino-cardiograph is such a smart wireless connected device with a unique characteristic: it is the first device to offer at the same time a measure of the cardiac contractility together with the traditional electrocardiogram. The data is sent to the cloud for a near instantaneous analysis where artificial intelligence answers the needs of the patient and the doctor as both will receive a feedback appropriate to their needs: simplified for the patient and very detailed for the healthcare professional. All the currently existing solutions only offer heart rate via the flash of your smart phone or an electrocardiogram. They lack a complete clinical cardiac assessment which requires measuring the mechanical function of the heart traditionally done with an echocardiography at the hospital. Kino was developed with the support of BELSPO and the European Space Agency for remotely studying the cardiac function of astronauts without the need of trained doctors onboard.  HEARTKINETICS Spin-Off project is now sponsored by the Brussels Region with a Launch grant from Innoviris. Our vision at HEARTKINETICS is that patients and doctors will use smart app and connected devices to gain a more personalized treatment and follow-up. This will benefit the health care system by hopefully avoiding post-hospitalization complications and decreasing the burden of unneeded readmissions. 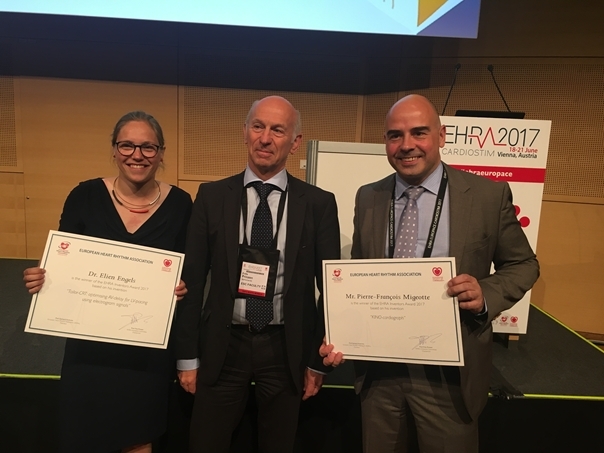 Dr. Pierre-François Migeotte from ULB (right) receiving the EHRA – EUROPACE – CARDIOSTIM 2017 1st inventors Award from Prof. F. Prinzen (center) – on the left 2nd laureate E.B. Engels from Maastricht.